What if your favorite song was never played? Written? Recorded? Your $10 donation = $300 in healthcare access for music industry professionals. 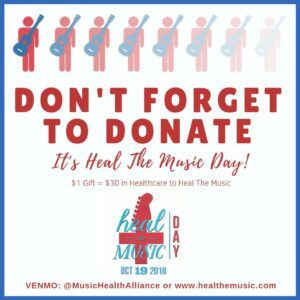 “Heal The Music Day” is an effort to raise awareness and support for those people who make a living in the music industry, 76% of whom are self-employed or part of small business without access to group health benefits – including songwriters, producers, audio engineers, musicians, recording artists, publishers and more. Your contribution keeps the music playing! Visit healthemusic.com to learn more about how you can commit to Heal The Music.